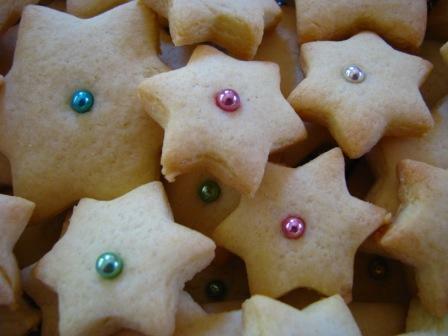 This is a very easy recipe for shaped biscuits. My three year old daughter enjoyed helping punch out the shapes and decorating them almost as much as she enjoyed eating them afterwards! (optional) Some of those little metallic balls used for cake decorating. My packet says they are called “cachous”. Cream butter and sugar, then beat in the egg. Add the flours (sift if necessary) and mix well. Tip out the dough onto a flat surface and roll out to about 0.5cm thick. 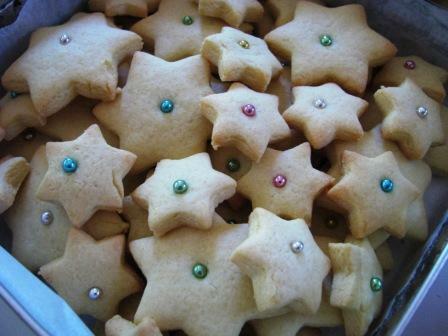 Cut into shapes – I recently found a set of different sized Magen David star shaped cookie cutters at Spotlight. 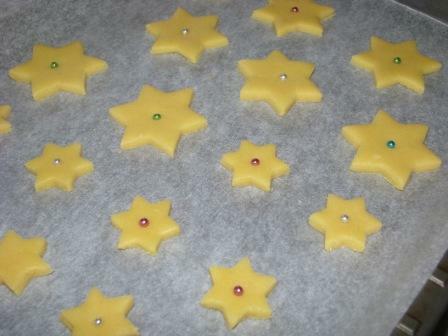 Place on a prepared tray (I am a big fan of baking paper rather than greasing) and decorate with a cachou if you are using them.